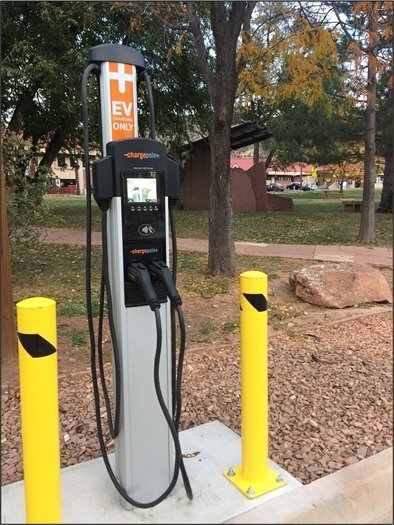 The Town of Lyons has completed the installation of an Electric Vehicle (EV) charging station on Railroad Avenue, by Sandstone Park. The station is available for any EV. There is charge of 20 cents a KWh (roughly $6 for a standard electric vehicle for 100 miles). The station is made by ChargePoint, who has the largest infrastructure of charging stations across the country. Charging sessions can be done in multiple ways. One option is to wave your free ChargePoint membership card in front of the station’s card reader. Users can also use the ‘Start Charging’ feature on the ChargePoint mobile app, or call the toll free 1-888 number displayed. This station was funded through Regional Air Quality Council and Boulder County grants. Earlier this summer, the Colorado Department of Public Safety, Division of Homeland Security & Emergency Management (DHSEM) conducted a site visit to review Lyons’ federally funded grant programs (administered by DHSEM), the related processes/procedures, and the quality of documentation being maintained to support program activities. The goal of the review was to help Lyons prepare for and respond to future audits and/or reviews. The full report can be found on the Financial Reports page. On Monday, November 7, the Board of Trustees will review the town response to the site visit at their regular meeting.